The portable vacuum pump was developed to enable the mini cyclone spore collector to be used in locations outside of the lab. 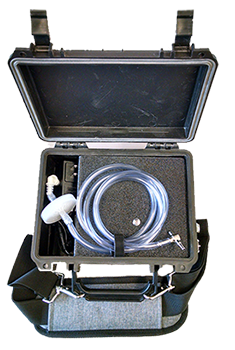 The pump is powered by a 12 volt battery contained in the case and comes with an adjustable shoulder strap to ensure comfort and ease of use. With a full charge the vacuum pump is capable of operating up to 3 hours continuously prior to requiring a recharge.